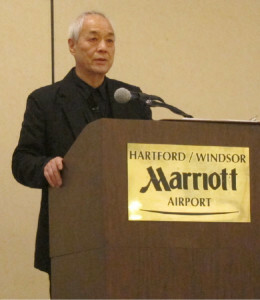 I had the great pleasure of attending the first Shingijutsu-Kaizen Conference held on 1-2 May 2014 in Windsor, Connecticut. The theme of the conference was “Reflecting on the First 26 Years, Evolving to the Next 25 and Beyond Succeeded by Next Generation!” Shingijutsu, as you may know, was founded in 1987 at the request of Taiichi Ohno, the father of the Toyota Production System (TPS), by Yoshiki Iwata, Chihiro Nakao, and Akiro Takenaka. This legendary TPS consultancy has helped re-make companies, large and small, around the world. Connecticut is a special place for Shingijutsu because it was where they got their start. And they continue to work in Connecticut today. Mr. Eto reflected on Shingijutsu’s formation in 1987 and its start in Connecticut and the evolution Shingijutsu shop floor kaizen. Mr. Nakao jokingly spoke about how he came to Connecticut: He was lured to Connecticut by Art Byrne, and the bait was lobster and golf! Then, Mr. Nakao talked about the role of strong leaders, such as Art Byrne, who lead by doing rather than by talking. Mr. Nakao discussed the theme of the conference, passing the baton – our knowledge and experience – to the next generation, and the importance of always going back to the fundamentals. Mr. Nakao’s slides contained the words “Master the Basics” in the upper right-hand corner. Indeed, too many people think they know the basics when they do not. Mr. Nakao referred to “queue time” as “stagnation,” which I think is a more useful way to think about stoppages in material and information flows. He said distribution centers are stagnation centers because they disconnect manufacturing and the marketplace and slow down or impair automatic reflexes. And, he said it is better to shrink lead-times than to outsource long distances. Only in recent years have leaders begun to recognize that. Mr. Nakao wisely noted that listening and understanding is not enough. You have to practice it. It has to become your skill, your philosophy, and your knowledge. That is how you evolve and develop your own path. Nakao-san said: “Kaizen in infinite. To make good product, you have to make good people.” Wise words. Art gave a heartwarming recollection of his first meeting with Mr. Nakao in 1988 and the business and personal relationship that developed. He discussed his Lean journey and experiences leading lean transformation for over 30 years. Art said that business is nothing more than people, processes, and delivering value to customers. The best team wins. Art also recounted the long-lived misunderstanding of Lean as a “manufacturing thing,” and asked the rhetorical question: “How do we get back on track” to understand Lean as a management system and a strategy for the enterprise. Art then discussed his book, The Lean Turnaround. 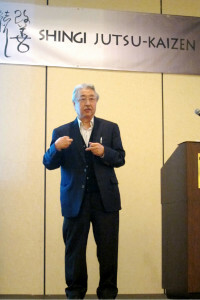 Mr. Nagamatsu spoke about the evolution of Shingijutsu-kaizen. Specifically, Systematic Integration of Quality Materials and Information (SiQMi) to be more responsive to customers, and highlighted the need for energy, knowledge, and top management engagement with the genba. People are an irreplaceable treasure. By taking one’s learning and putting into practice, people advance from their current capability to reach higher levels of capability. The idea is to make a strong person even stronger. But, a bad management system means people are blamed for problems – purchasing, marketing, suppliers, etc. Improve systems and improve teamwork to achieve better outcomes. Lastly, Mr. Nagamatus talked about Speed Design Review (SDR) to address intensifying competition, increased customer expectations, and shorter product life cycles. The practice includes rapid cycling through idea-prototype-evaluation in R&D with cross-functional participation in a cellular-layout work area using human creativity and right-sized equipment. Daryl spoke about the experience of re-making GE Appliances through genba kaizen and Speed Design Review. The Appliances division was struggling in 2008-2009 and nearly put up for sale by GE Corporate. To survive, they transitioned from physically separated units and functional silos to obeya and cross-functional teams working together to create new products for customers and grow. They reorganized production via kaizen, and they abandoned their tollgate product development and functional approval processes and transitioned to an integrated, collaborative product development process. The rapid success that followed this changes was remarkable. Highlights of Day 2 appear in the next post.